Medical ID Store Is the Original Designer and Creator of The Medical Id Sports Band 3, The Interchangeable Medical Id Sports Band and The VNS Magnet Bands. Our Designs are done with quality and safety in mind. No Refunds on custom engraved items. Please ask any questions prior to ordering. Just because you get it and decide you do not like it is no excuse. NO REFUNDS ON CUSTOM ENGRAVED ORDERS. Medical Id store focuses on your medical safety and well being, however we also focus on your online identity and security. We are fully encrypted and secure for your shopping safety. Medicalidstore.com uses SSL security. This security is used with the safety of your shopping in mind. We also offer Lifetime Warranty on engraving on some of our products for back engraving and a 1 year warranty on front engraving. This applies to certain products and will be in the product description. Please ask if you are unsure which product it applies too. We have many Medical Id Bracelets, Medical id Jewelry for Kids, toddler medical id, teen medical id alert and Adult Medical alert jewelry for men and women. Medical id Watches and Medical Necklaces. 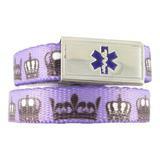 Medical ID Sports Bands, Nylon adjustable fun medical id sports band bracelets offered at discount prices! 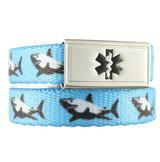 Medical Id Store also has Kids Medical ID Alert Zipper Pulls, Medical ID Watches, Medical ID Alert Sports Bands. We Carry Hypo-Allergenic Medical Id Alert Tags and Jewelry, VNS Magnet Therapy Sports Bands for your VNS Magnet, Epi-Pen and Asthma Cases and Pouches, custom engraved wallet cards, Toddler medical ID shoe tags, adjustable fast strap medical bracelets, Mens stylish medical watches. 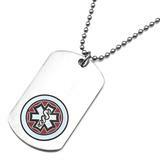 Medical Jewelry with style and safety in mind! 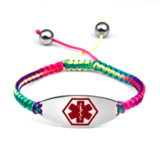 Check out our Medical ID Bracelets for Kids , Mens, Women, Teens, Boys and Girls Medical Id Jewelry, Medical Id Sports Bands, Medical Alert Key Chains, Infant Baby Toddler Medical Shoe tags, Medical Watches, Classic Bracelets, and Stainless Steel Medical id bracelets, medical charms, fun medical necklaces for kids, rubber, jelly, silicone and latex free medical band bracelets. Your store for all of your Medical Id needs. 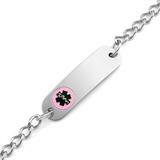 We specialize in custom engraved personalized medical id alert bracelets, Medical ID Sports Bands, necklaces, Medical Id store offers many designs from your classic traditional stainless steel medical id bracelets and necklaces, sterling silver medical alert charms, fun water resistant medical id sports bands that are adjustable in fun designs!